Due to the decision not to carry out the malolactic fermentation, it has retained a remarkable freshness which lightens and elongates the palate. 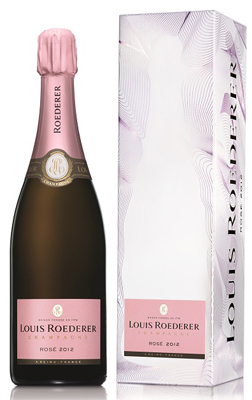 Over the years Louis Roederer has developed a unique technique for the production of its rosé champagnes. This process, referred to by Roederer as the ‘infusion' technique, allows us to bring out the juicy, ripe character of the Pinot noirs whilst preserving their exceptional freshness. A small amount of Chardonnay juice is added to the Pinot noir maceration which then ferment together and integrate harmoniously. Vintage 2012 was one of the most challenging and complicated years ever experienced in Champagne. Yet difficult conditions often lead to great things. The low yields, due to the vagaries of the weather, combined with continental conditions towards the end of the season, gave unusual levels of maturity, resulting in rich, full-bodied and structured wines worthy of the greatest vintages in Champagne. The cuvée Rosé 2012 was bottle-aged for 4 years before being left to rest for a further 6 months after disgorging in order to attain perfect maturity. The dosage is 9 g/l. A great Rosé champagne must be made from very ripe grapes - sometimes difficult to obtain in the Champagne climate. As a result, Louis Roederer has chosen to invest in one of the earliest Champagne crus villages,Cumières, for which the steeply-sloping, shallow clayand limestone soils face south and benefit from additional light reflected from the river Marne, enabling great phenolic maturity to be achieved. In these select terroirs, Louis Roederer applies the precision wine-making methods required to craft a saignée rosé. The Chardonnay is from the north facing slopes in Chouilly, bringing bright and fresh notes.